Frozen Frenzy is the seventh level of Donkey Kong Country: Tropical Freeze located on Donkey Kong Island. This level is closely related to the Factory levels of Donkey Kong Country Returns, but here it is covered in ice due to the invasion of the Snowmads. This factory-themed level features many electric-based obstacles, such as purple electrical beams created by Electroids that deal damage if touched. Electroids form many other major obstacles in Frozen Frenzy. For example, the level contains moving platforms that travel over Electroids; circuits form when the platforms connect to the Electroids, therefore charging the platforms. The Electroids also shoot currents at vines that the Kongs must climb, which sends a damaging current throughout the entire vine. The level is almost entirely covered in ice, which makes traction difficult, and some ice platforms also break moments after Donkey Kong lands on them. Besides the Electroids, enemies in this level include Pointy Tucks, Painguin Tucks, Waldoughs, Walnuts, Hootzes, and a Fish Poker Pops. 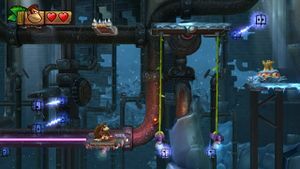 The music track for this level is entitled "Frozen Frenzy," which is a much slower remix of the factory music from Donkey Kong Country. The level starts out where frozen pipes and steel platforms are. First the player must re-activate the factory by pounding the golden platform for three times. The player must avoid Electroids and their emission all the way in the level. If a ball touches a plug, a platform or a vine with a plug under gets electrified. Near the end, an eyeball-like machine from Handy Hazards in Donkey Kong Country Returns that has stopped working can be seen in the background. K: This letter is found above the first DK Barrel. The Kongs have to stomp a Hootz to reach this letter. O: After the imbalanced platform with three pairs of Electroids, the Kong should see this letter on the crumbling platform. N: This letter is located just after the second checkpoint. The Kongs must stomp over a Waldough and a Hootz to collect it. Dixie Kong's Helicopter Spin can also be used. G: This letter is found over the crumbling platform after the complex of zaps near the goal. 1: Directly next to the golden platform. Player must escape upwards because the platform under the Puzzle Piece crumbles. 2: There is a thin platform and two pairs of floating Electroids after some moving platforms. Player gains access to the secret room after pounding it. 3: Just after the checkpoint, moving platforms are seen again and there are six bananas in a row. Player must grab all of them to gain a Puzzle Piece while avoiding Electroids. 4: After the third Puzzle Piece and imbalanced platform, a barrel is seen under the screen. It brings player to the bonus room. 5: There are two balancing vines with Electroids just before the second checkpoint. It is located upwards of these vines, so player should grab the further vine, climb, and go to the other one as quickly as possible, then grab a wall on a left side and climb it. The player can go across these two vines from right to the upper left starting from the fixed platform with the second checkpoint. Spanish Energía hieléctrica "Icelectric" Energy, that hieléctrica is a pun on hielo for ice and eléctrica for electric. This page was last edited on April 15, 2019, at 12:45.